Be the first to share your favorite memory, photo or story of Girishbhai. This memorial page is dedicated for family, friends and future generations to celebrate the life of their loved one. 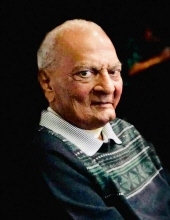 Girishbhai Patel, 71 of Keokuk, IA died Thursday, March 28, 2019 at the Great River Medical Center in West Burlington, IA. He was born August 24, 1947 in India, the son of Maganbhai and Kamlaben Patel. On May 16, 1971 he was united in marriage to Shakuntala Patel in India. She survives. Other survivors include one son, Bhavesh Patel and his wife Nisha of Canada, one daughter, Alpa Patel and her husband Jigar of Keokuk, four grandchildren, Kishan and Isha Patel both of Canada and Janvi and Jiya Patel both of Keokuk and one brother, Arvindbhai Patel of Keokuk. Girishbhai was of the Hindu faith. He was the owner and operator of the Chief Motel in Keokuk for many years. He was very sociable and personable, loved visiting with others and enjoyed meeting new people at the motel. He also enjoyed traveling. "Email Address" would like to share the life celebration of Girishbhai Patel. Click on the "link" to go to share a favorite memory or leave a condolence message for the family.